1. 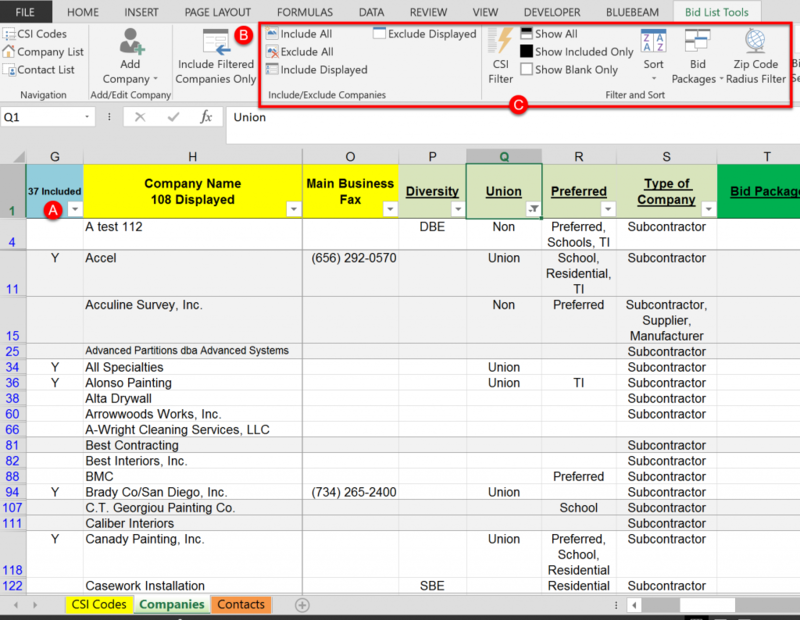 Open your company’s Master Bid List and enable macros. Important Note: Never copy and paste an existing bid list and use it for a different project, always start from your company’s Master Bid List file. 2. 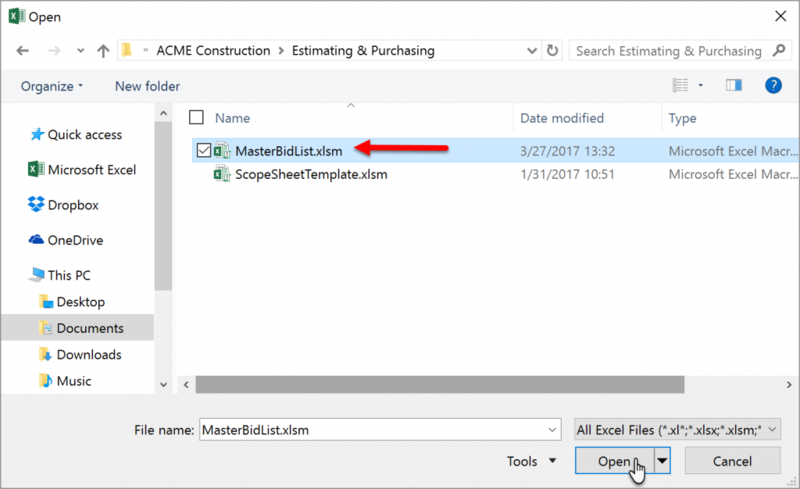 Enter a project name (A) and choose a folder to save the project bid list (B). Note: You can change the project name at any time. 3. 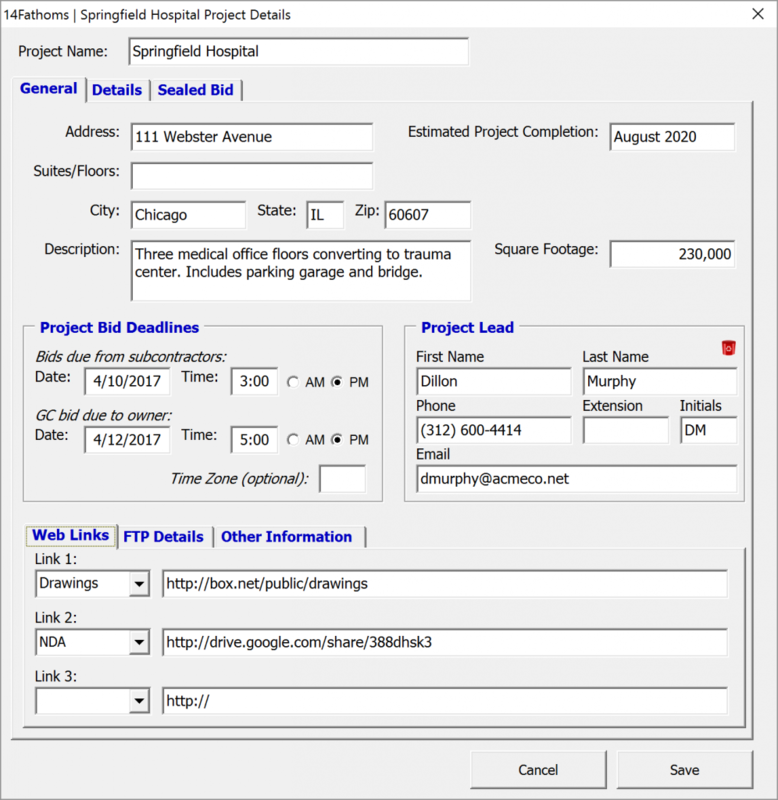 Optional but recommended: Input the project specifics in the project details screen. Click Save. 4. On the “CSI Codes” tab choose the CSI trade divisions that you will invite to bid. Trades with a “Y” in the “Include in Sublist” column (A) will be included (blanks and Ns will not be included). Manually put a “y”, for yes. Click the “Add Common Trades” button in the Bid List Tools toolbar (B) to put a “Y” in all your company’s common trades. 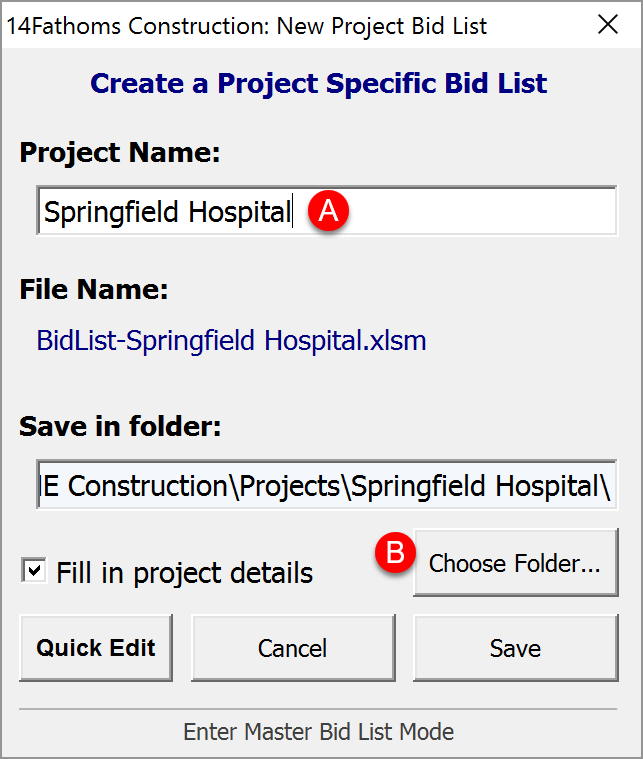 Use the “Select All” button in the Bid List Tools toolbar. Import the selections from a previous 14Fathoms bid list. If this new project is similar to a project used in the past, double click the “Import” button (C) and select the old project to begin the import. Optional: After selecting the trades you can assign team members at your company to those trades. Use the drop down in the “Bid Taker” column (D). Note: You can select more trades to include on a bid or remove them if you realize that trade isn’t needed at any time. 5. 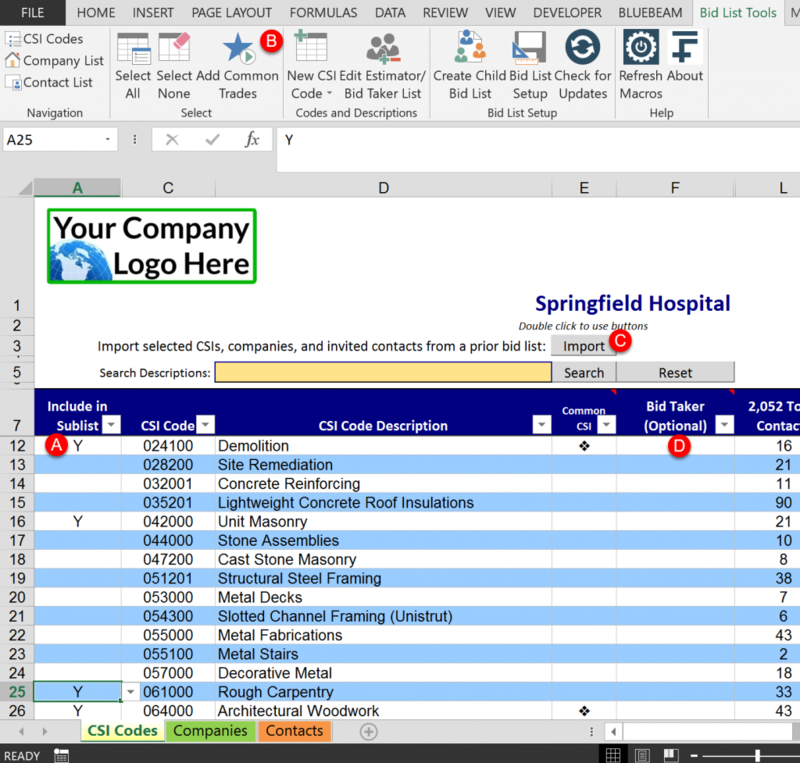 Once complete click “Company List” in the Bid List Tool toolbar or click the Companies tab. Optional: Choose the companies you want to invite by including a Y in the first column (A). You can filter on any criteria and click the “Include Filtered Companies Only” button (B). There are other shortcut buttons as well in the Bid List Tools toolbar, including a zip code radius filter, to help filter the list to the companies you want to invite (C). 6. Click the “Contact List” button in the toolbar or click the Contacts tab. Only the contacts at the company’s that work in the CSI division you chose are shown. Tip: Click the “Primary Contacts” button to only show the primary contacts as those are the individuals who typically receive the invitation to bid email (A). Optional: you can further refine your invite list by using the “Invite Filter” column (B). If you put an “N” in that column then click the “Bid List Invite Filter Toggle” button (C) it will hide those specific contacts (D). 7. Select the contacts you want to send the invitation to bid email. 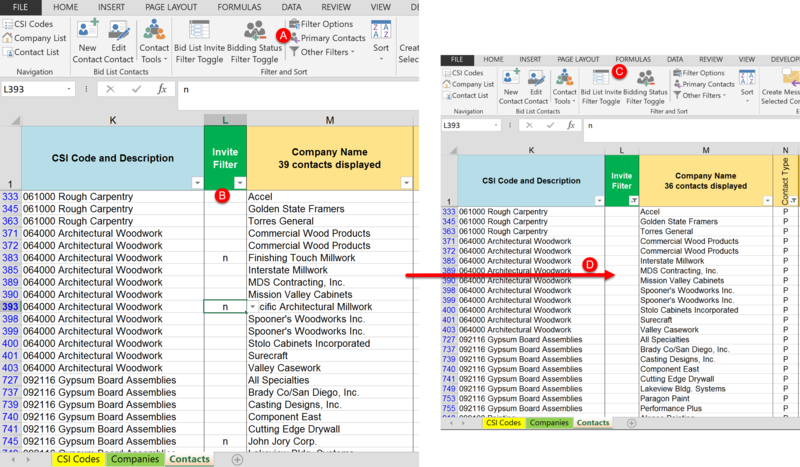 Tip: To send to all visible contacts, click the entire Email column (A). 8. 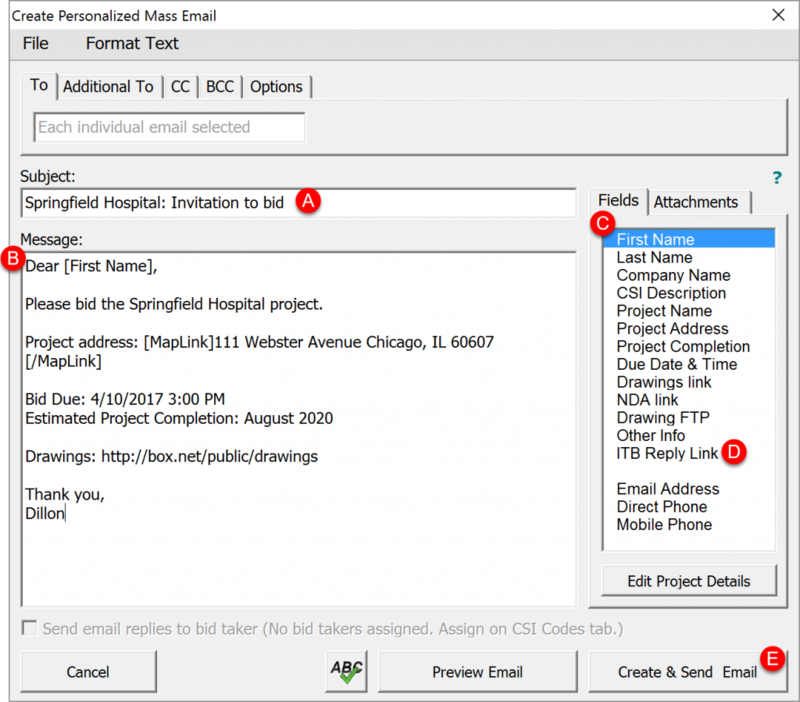 Click the “Personalized Mass Email button in the Bid List Tools toolbar (B). 9. Enter a subject and message (A & B). 10. Double click the fields to add them to the message (C). Similar to a mail merge, the fields inserted will be replaced with the actual contact’s information, personalizing the email for each contact. Be sure to include the ITB Reply Link (D) to include a unique link for the subcontractor to use to respond to the invite. Tip: If sending a large number of emails, send them before going on a break as you shouldn’t use your computer while the emails are being created and sent. The invitations to bid will be in your Sent email folder and you can track subcontractor’s bid status manually and/or wait for the subcontractors to respond using the invitation to bid link which will automatically update the Bid Status column. 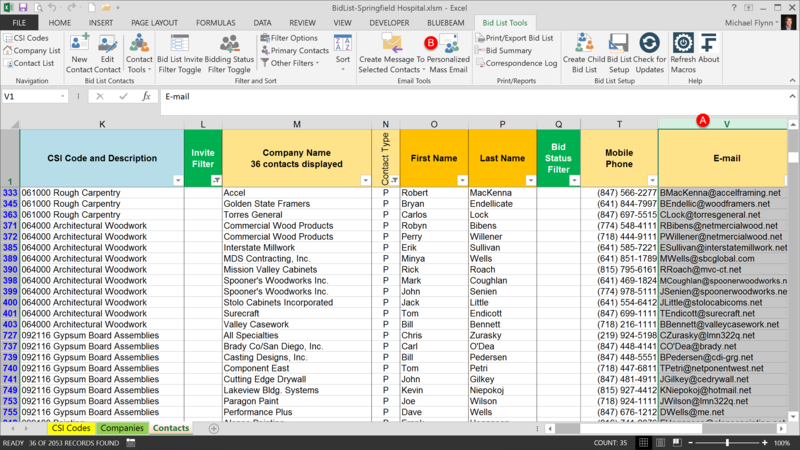 ← How do I extract and create (or duplicate) a Scope Sheet file for a coworker?